The preservation of a nation's heritage has always been limited by the ability to store it safely like in a museum. Today, museum managers also think about efficiency, space optimization and high capacity storage solutions adapted to each kind of collection. 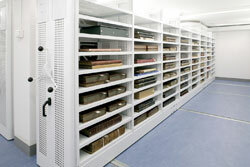 From Archaeology to Zoology your special storage needs can be met by Euromech’s high capacity line of products. Euromech offers products with features developed exclusively for museum shelving: Electrical and Mechanical high-density mobile storage systems.